The annual Aloka Pooja by Wijeya Newspapers will take place at Thanthirimale for three days on June 27th, 28th and 29th, with Poson Poya day falling on the 27th. This annual offering or Pooja continues for the 15th year without a break, bringing devotees to this sacred city in large numbers. To take part in an offering or a Pooja is something that is practised by all religions. Catholics offer gifts and donations at the Altar during their offertory ceremonies in the Churches. Buddhists do the same to the priests or Lord Buddha at temples and at religious sites. The concept of offering light or a lamp is widely practised by Buddhists, and so is the concept of Aloka Pooja. Aloka Pooja is not just hanging bulbs and switching them on at a ceremony. When a Buddhist religious site is lit up, we consider it as an offering or a Pooja to the Lord Buddha and an external sign of our veneration. It is in this light that we should accept this annual event at Thanthirimale. The management and the staff of Wijeya go to great lengths to conduct this Aloka Pooja annually. This, they have done over the past years successfully. The preparation for this annual event starts in earnest a couple of months in advance. This time there was more time since Vesak celebrations were held almost two months ago. During Poson, we remember the historical events that took place for the establishment of Buddhism in Sri Lanka. We remember the arrival of Ven. Mihindurahathanwahansey to preach the great doctrine to the king and the people, during this time of the year. We have heard again and again the historical details about this visit and how the Great King Devanam Piyatissa accepted the great doctrine humbly. He took all the means available to see that it was preached to all corners of the island. Thanthirimale has the added importance of celebrating not only the arrival of Buddhism but also the fact that Ven. Sangamitta Therani brought with her a sapling of the Sri Maha Bodhi, from India on that great Unduwap Poya Day many centuries ago through this humble village. Thanthirimale became famous because of this singular event. Ven. Sangamitta Therani was the sister of Ven. Mihindu. Thera. The sacred sapling was kept overnight on its arrival at Thanthirimale before it was taken to Anuradhapura by the King and his royal entourage accompanied by the two venerable siblings. 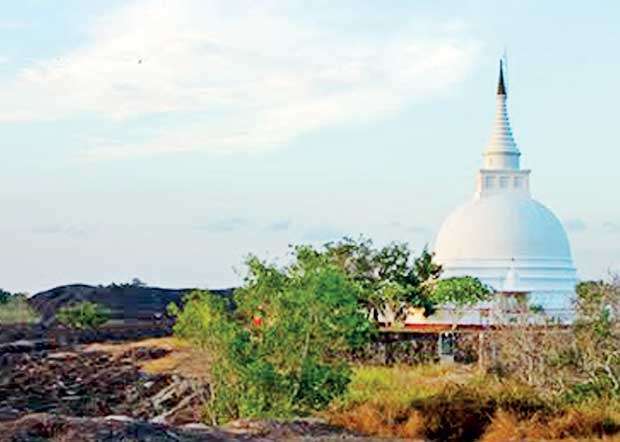 The journey must have been very religious and very colourful as the royal procession meandered along the Malwattu Oya to the main city of Anuradhapura. The Sacred Bodhi that is at Thanthirimale presently, is the eighth shoot of the original Bodhi that was brought to this country. This was a gift to this humble village by the King for the reception that was accorded to the royalty a couple of years back. It is believed that the sapling was planted at the spot, where the original sapling was kept overnight for veneration. The sacred Bodhi at Thanthirimale continues to grow overcoming threats from man, beast and the unpredictable weather in the area. For centuries the whole area remained unpopulated, being the abode of only wild beasts. The sacred Bodhi had withstood many a storm and invasions from all corners. It continues to flourish and grow. The Aloka Pooja is held while commemorating these historical events, to pay homage to Lord Buddha and the Sacred Bodhi. It is a sacred occasion and all those who take part in this religious event annually are guided by the very principles that have been bequeathed to us by history. The pilgrimage to Thanthirimale is less troublesome now with improved facilities. The authorities are forever improving these facilities and hopefully, the number of pilgrims will continue to increase in the years to come.